The house is very spacious and has been divided into large and elegant apartments offering 17 bedrooms and 9 bathrooms ideal to accomodate large groups up to 33-36 people .The property has been completely restructured in full respect of the Tuscan architectural style, with the handsome façade in bare stone, the door and window frames in grey sandstone, the roof ventilated with modern technology but made using the ancient tiles, the interior floors in classic red terracotta, the ceilings with great beams in chestnut, oak and cypress, or beams in antique terracotta, the plaster walls tinted in pale hues, the stone stairways, and the original frescoes that decorate some of the ceilings. Community area with oven, grill and a zone equipped with tables and benches for outdoor enjoyment. Large arcade , panoramic pool and a heated hydromassage pool for 6/8 adults set amid olive trees. A luxury holiday in the modern life needs space, silence, nature. We've got it! The property keeps ready for the guests the fine restoring of the medieval house and the care of the interiors as well as the largeness of its holiday accommodations, the quietness of the countryside, a panoramic hilltop location amid nature with an amazing view on the Florentine hills. 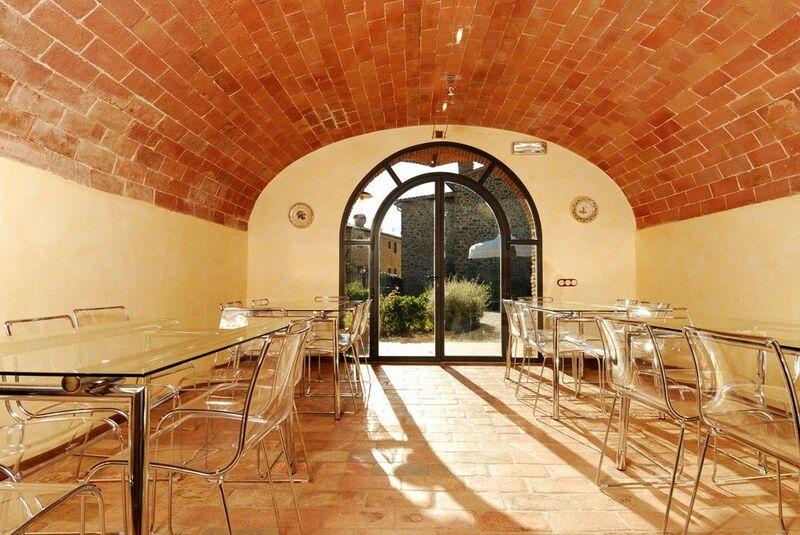 The ideal location: The property is in a perfect position for traveling around in Tuscany only 25 minutes from the centre Florence, which is only 25 km far from us. many trains to Pisa, Siena and Rome stops there too. So the property stands in hilltop position amid olive trees in the Leonardo's land but it 's only few kilometres to the main road of the area and to the important railway station of Empoli. We would remark our property is in the most exclusive area of the municipality of Vinci which includes both hills and the industrial plain. We're in hilltop position and not in the plain or in a basin amid hills: take always care to verify the real position of any property! Grill- barbecue, ancient wood burning oven and large. Gazebo equipped with tables and benches, where guests can cook and enjoy their time. Ping Pong table and table football. Large panoramic arcade equipped with tables and chairs. umbrellas, shower, toilet and changing room usually open from April to October. Heated Spa Hydro massage pool for 6/8 people set amid olive trees under a patio. Fridge, freezer, microwave oven, dishwasher, hair dryer. TV sat in each apartment. Air conditioning/heating in each room. Daily breakfast, a typical Tuscan dinner, extra virgin olive oil tasting, wine tour & tasting. Podere Jana is a family owned property with the help of a small staff of people which will respect your privacy offering help on request. The villa belonged to our family for several generations who dedicated themselves to the cultivation of the land and the production of oil. The rooms of the villa have been dedicated to all the women of the family ( Mrs Rina, Amelia, Zelinda, Gisella .....) who lived there, giving their energies in support of agricultural work. Our father decided to restore this 16 medieval stone villa in respect of the past and in honour of his ancesters. All bathrooms are not ensuite . All bathrooms are large and equipped with modern fittings. Each apartment is equipped with full set of towels and hair dryer. In the garden there's grill barbecue and a wood burning oven perfect to cook pizza . Beside you'll find a large gazebo with tables and benches to enjoy grillades or pizzas all together. The villa offers 8 kitchens equipped with stove, fridge, freezer, dishwasher, oven. In addition you can choose to rent with a 7% fee a central professional kitchen with fittings to cook for groups. A large panoramic arcade with table and benches overlooks the tower of Vinci and the hills A spacious gazebo in wrought iron equipped with table and chairs for 30-35 people in the garden is set close to the beautiful restored grilled barbecue and wood burning oven in stone The large swimming pool 6x12 metres is exposed to the sun from early in the morning till sunset A heated hidromassage pool for 6/8 people is set at the open air surrounded by the quietness of nature Sunbeds and umbrellas around the pool, showers , toilet and changing room complete the area surrounded only by olive trees. Enclose private parking. Ping pong table and table football for children and young people. The medieval villa with pool is located near Florence and exactly inside the famous municipality of Vinci, Leonardo's birthplace, just 25 km from Florence centre and 5 km from the railway station and its frequent trains to Florence, Pisa, Siena (the best way to visit Tuscan cities). The New Golf Club Bellosguardo 9 holes located in Vinci only 3 km distant reachable in less than 5 minutes by car or Golf Club Fontevivo located in San Miniato only 15 km far from us reachable in 15-20 minutes. Both the golf course are made up of a club house and 9 holes plus a restaurant and bar. About the Fontevivo Golf you can see the tower of San Miniato from many windows of the property too, so you can't fail direction! breakage deposit for the whole property rental is equal to 1600 euros A 25% deposit is required at booking to confirm your reservation Prices including: full set of towels, full set of sheets, electricity, water, final cleaning, access to all common areas and equipments, private parking. Air conditioning/heating is not included and it will cost 125 euros per day for the whole property made of 8 apartments and 17 bedrooms only if required as extra service at check in, depending on the season temperature The property offer a professional central kitchen with all the fittings to cook yourselves for a large people party. Please take note the rental of these fittings is optional but if required it will cost an additional fee equal to 7% of the rental cost, including the energy supplies. No other fees Quotation of optional meal extra services on request Special discounted rate if you wish to rent the property for a lower number of people within the number of 16-20 people instead of 30-35 If you're flexible with your dates, please take the opportunity to book one of our promotional week To advertise the property throughout the world, we offer the possibility to book the whole estate with its 17 bedrooms at the very reduced price of 7500 euros in all for 7 nights or at 1400,00 euros/night for 4 nights in October a mild mounth where the pools are still open.